Neptunium is a metallic solid and very reactive radioactive actinide that was long theorized to exist (Dmitri Mendeleev - 1870s) before finally being synthesized during the atomic age of 1940. Edwin McMillan and Philip H. Abelson created the first observable neptunium element via neutron bombardment of uranium at Berkeley Radiation Laboratory. Neptunium is extremely scarce in nature and can only be found in trace amounts in uranium ores within the Earth’s crust. 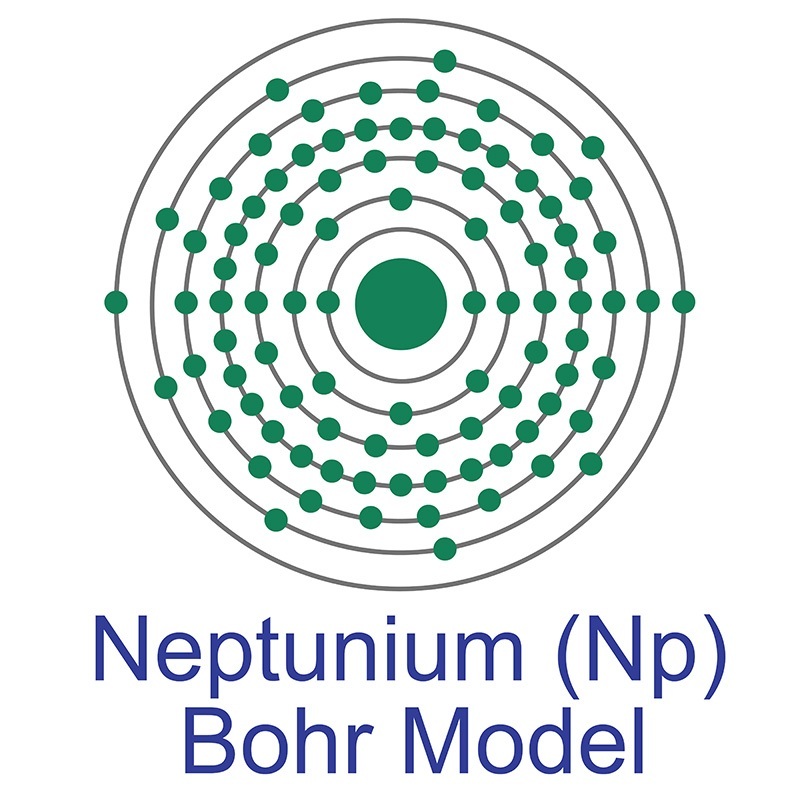 For this reason, neptunium is primarily available only through neutron bombardment of uranium, but is also produced as a by-product in nuclear reactors. It was the first transuranium element to be synthesized. The half-life of its most stable isotope, 237Np, is over two million years and decays into thallium and bismuth; primarily through alpha decay. Though neptunium has limited practical uses, Oak Ridge National Laboratory sells certain quantities for legal uses. It is widely used as a precursor step in the generation of 238Pu, an element often used in radioisotope thermoelectric generators to power deep-space spacecraft such as Voyager and Cassini-Huygens. Neptunium, as a standalone element, is primarily used in detectors of high-energy (MeV) neutrons. Recent research has shown that neptunium could be used as an atomic weapon with a critical mass around 60 kilograms – and with about 60,000 kilograms of neptunium being produced as a byproduct each year, the Federal government recently (2004) made plans to store isolated neptunium in nuclear-waste disposal sites. After 10,000 years, due to its long half-life, neptunium will become the dominant element remaining in nuclear waste being produced and stored today. Due to its reactionary nature, neptunium is known to oxidize quickly and produce compounds with several other elements, including unusual metal-metal compounds with aluminum and beryllium. It is primarily reactive with oxygen, steam or acid but does not react to alkalis. There are no known uses for any of these compounds outside of fundamental scientific research. Nineteen radioisotopes of neptunium have been observed. Excluding 237Np, the half-life of these isotopes ranges from 3 milliseconds (225Np) to 154,000 years (236Np). Neptunium has the atomic symbol Np, atomic number 93, and atomic weight 237. It is a Block F, Group 3, Period 7 element. The number of electrons in each of Neptunium's shells is 2, 8, 18, 32, 22, 9, 2 and its electron configuration is [Rn] 5f4 6d1 7s2. The neptunium atom has a Van der Waals radius of 221.pm. In its elemental form, CAS 7439-99-8, neptunium has a silvery metallic appearance. The element was discovered by Edwin M. McMillan and P. H. Abelson in 1940. It was the first synthetic transuranium element of the actinide series discovered and was named for the planet Neptune. Neptunium information, including properties, research, applications and other useful facts are discussed below. Scientific facts such as the atomic structure, ionization energy, abundance on Earth, conductivity and thermal properties are included. Neptunium is an artificial element. It has no stable isotopes.